Glitter Bay 212 “Sunset” is a perfect vacation spot for families and small groups. This two-bedroom villa offers all the conveniences of home, including air-conditioning, full kitchen, cable, and wireless access. Housekeeping four days a week is another perk at the villa, along with nearby tennis courts, and beachfront access. Choose to prepare your own meals or order from the nearby patisserie and enjoy your meal at the breakfast bar or the balcony. Holetown is just minutes away, so restaurants and shopping are easy to reach. Beachfront location and close to Holetown! Sunset is a two-bedroom apartment in Glitter Bay Resort, with approximately 1,300 square feet of living space. This fully air-conditioned property has vibrant, nautical accents and modern amenities. The large balcony has a dining table for 6 and a sitting area with nautical steamer chairs. Views of the gardens and pool make this the perfect place for evening cocktails, relaxing, and reading. A large, retractable awning allows guests to bask in the sun or retreat into the shade. The balcony opens to the living area, which features a flatscreen TV, plush furniture, and vibrant decor. Stay entertained with a selection from the villa’s book and DVD library. A high breakfast bar separates the living room from the galley-style kitchen, which is fully equipped with stainless steel appliances and top-of-the-line cookware. The master bedroom has a ceiling fan, balcony access, and a king-sized bed that can be converted into two twins. It also has an electronic safe and an entertainment system. The ensuite bathroom has a glass-enclosed shower and double sink vanity. The second bedroom has two separate beds which can be made up as a king-sized bed, a ceiling fan, rattan furnishings, and a nautical blue and white color scheme. Like the master bedroom, it has an electronic safe and an entertainment system. The second bathroom is located in the hallway, and has a glass-screened bath and shower. 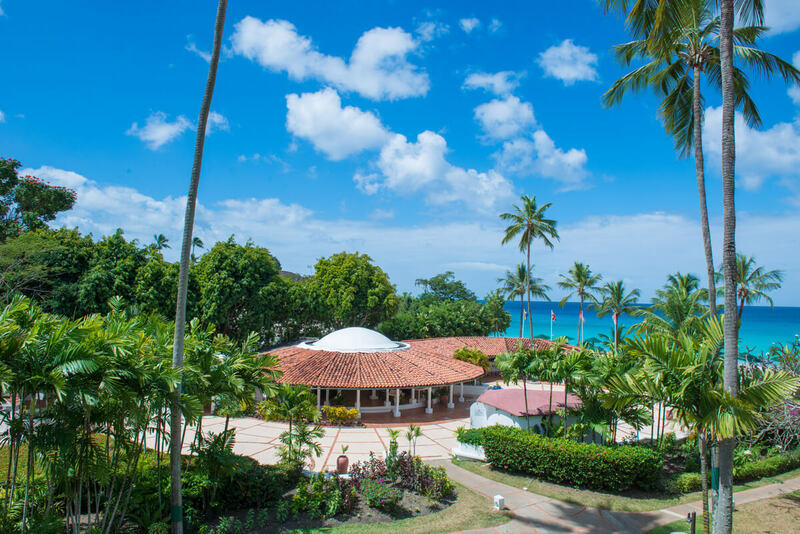 Glitter Bay guests have access to a large swimming pool, complimentary beach loungers and umbrellas, an onsite restaurant and bar, a private gym, and the tennis courts. Several restaurants, shops, and activities are just minutes from the complex. Quiet and comfortable with lovely, comfortable sofas in the living room. Kitchen had an impressive array of dishes, glasses, baking dishes- everything you might need. The balcony was one of our favourite spots and it was even more usable with a roll out shade for the dining area. We had no problems and really enjoyed our stay. Glitter Bay just can’t be beat! Sharon Masters is without doubt the best, most helpful agent we’ve ever used to book our holiday rental accommodation. Sharon info was complete, helpful and her emails were extremely timely. I recommended her services highly to other renters while in Barbados and plan to book in the future with, “Where to Stay”. With a free rental car , free night and the ease of using our credit card for payment ( with no extra fees), along with Sharon’s excellent service, there’s no doubt that we got the best deal at Glitter Bay.